Red Line’s Racing Oils have a global reputation as the ultimate racing lubricant—many teams who have found that the improved performance and equipment durability is the key to winning. Our oils are made with the most thermally stable synthetic base stocks available and provide the best high-temperature lubrication and a higher film strength than any petroleum or synthetic on the market today. Although Red Line racing oils are categorized as “straight grades”, their low-temperature properties make them exceptional multigrades, allowing 2-4% more power than an oil of similar viscosity, while providing much more protection. Each reduction in viscosity grade allows 1-2% more power. To reduce the chance of detonation, our race oils contain very few detergents and are not recommended for street use. 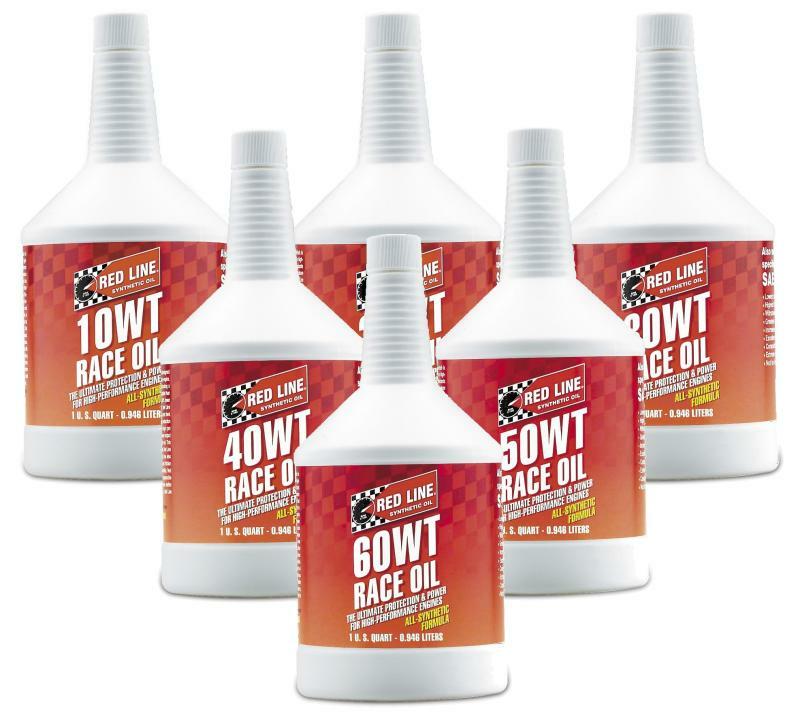 Used by top NHRA Stock and Super Stock, and Pro Stock teams looking for an oil with very low viscosity but slightly more durability than other brands at this weight. For drag racing and circle track qualifying where the lowest internal friction is desired. Many drag racers run this oil for 10 to 12 passes before changing, with no sign of shear or loss of viscosity. 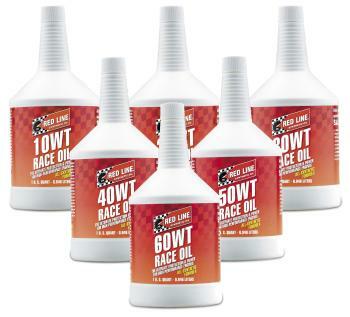 For drag racing, circle track qualifying, and racing engines designed for low-viscosity oils. Many drag racers run this oil for 10 to 12 passes before changing, with no sign of shear or loss of viscosity. Popular with bracket racers looking for extra performance. Suitable in well-balanced racing engines for sustained high-speed use where low internal friction is desired. Popular in bracket engines, 355 Sprint Car engines, and World of Outlaw 410 engines. For use where temperatures may be high and when a wide range in RPMs and speeds will be encountered. For use where extremely high temperatures may be encountered and when engine durability is the primary concern. For supercharged alcohol engines like NHRA and IHRA Top Alcohol and Pro Modified classes. Used by many of the most successful teams in NHRA Top Fuel and Funny Car competition, including Kalitta Motorsports. This oil provides greatly improved piston skirt wear, longer bearing and crankshaft life, and less valvetrain wear.